If the application holds true filming Nov/Dec so take what you will from that. It would be nice to get the official word that TAR has been renewed first, aside from BVM's Emmy words. Agreed, would hate to see this put off till spring. First, the Winter Olympics are in February, so I think TAR 16 would not brgin airing before the final Sunday when the Olympics close in Vancouver. Second date to keep in mind is December 6. While its a projected date for TAR 15 to finish, it's based on how, with the exception of TAR 12, fall airings of TAR tend to finish on the third Sunday preceeding Christmas since CBS likes to have Survivor on the second Sunday prior to Christmas. This would point to three spans of dates. A 21 day period ending just before December 6th, the period just after December 6th (which meand filming past Christmas and possibly New Year's), or after New Years since TAR wouldn't start airing until the latter half of February or early March, so it would finish airing in May. The Olympics is a great point, it is always possible we could see a later start this time. I am not entirely sure though that the finale date of TAR 15's airing would in any way affect the start date of TAR 16.... We all know Phil has missed TARcon's and check presentations before, due to filming. Always assuming we are going to HAVE a spring season this time... although there is a buzz for a November filming. I'm with puddin, we need an official confirmation before we get too excited. Doesn't the 4/16/08 renewal for 15 episodes imply that a spring season has already been greenlighted? I believe the April 16th announcement was in reference to TAR15 per Phil's tweet. I hope it's soon! I wasn't around for all the TAR15 spoilers and want to see the TAR16 spoilers first hand! 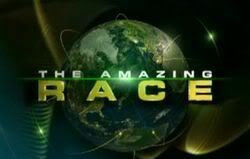 Hell I would go on the Amazing Race with your Mom. - Two legs in East/Central Europe. I hope the producers of TAR will read it. I vote we keep this for facts/rumors about the TAR 16 start date, there are threads for wishlists/applications/prediction games aplenty. Sorry Peach! Though I would love to see a season of TAR run with the RFF crew as a whole. It would make for a great 10th anniversary season! Yeah, I would imagine that it would be a safe route to pursue. OTOH, you've got the Closing Ceremony on February 28 (Opening is on a Friday, the 12 of that same month), but then the following week is the Academy Awards. That means the show would start on March 14 to best avoid all of the conflicts. Basically TPTB would have cram the season in so as to best have it end during May sweeps. In cramming, that would mean moving the Survivor finale to May 23 and having TAR16 run for 10 weeks, including a 2-hour episode somewhere in there. Given that, and the fact that there may be some Country Music Awards show (or the like) on a Sunday somewhere in there, I think that they'll start immediately following the Superbowl. That way, they get the show going instead of starting it during all the other stuff. I would think it would be best to get two weeks in there; however, the Grammy awards air a week before the Superbowl. This is the third time that TAR has aired a season during the Olympics, with TAR2 and TAR9 (or 4th if you count TAR5 and the 2004 Games). However, IIRC, the show was still midweek, sans the necessity to finish the season before the Survivor Finale and Live Reunion. Without Survivor being a conflict, Seasons 2 & 9 was able to surface after the Olympics. With TAR on Sunday, it'll be interesting to see what happens with all the stuff going on. My guess is that between TAR and Survivor, based on everything we may we may not know, Survivor may get the post-Superbowl slot. Regardless, I hope we get a season this spring (as there are several options around this). FWIW, I hate to see the show pushed back, because if so, it might be a Sept-Dec run (instead of a summer run that would make more sense). I would think CBS can take the hit ratings wise for three weekends that the Olympics are on. TAR is relatively cheap compared to a drama. And the ratings go back up when the Games are over. Keep in mind that TAR,in general, is two episodes shorter with the fewer NELs than it was for the previous seasons that were aired during or after Olympics periods. CBS has had a Survivor finale as late as, and even later than May 23rd. There's also the issue of losing one weekend in March to the NCAA Basketball tournament. But a start in March might avoid the Oscars, although some sports overruns due to basketball and golf are still likely. One reason why I expect CBS will avoid the Olympics period is because of the location. Many events and finals can be aired live in primetime with no chance of people being spoiled with events timeshifted for prime time airing. I don't know how many hours NBC is planning, but with a dozen cable networks to play with plus almost all of their NBC affiliates now having 2 or more digital channels to program, I suspect it'll be wall-to-wall, even more than the games in Beijing, Salt Lake, or Athens. How about TAR 16 starting in Whistler BC and premiering on Feb. 14th? That way CBS gets to cash in on the Olympics hype from the other networks without paying for Olympic rights. And - Whistler has been really promoting themselves ahead of the Olympics - look at Hells Kitchen this season - so you get promotional considerations - ie product placement. I'll keep an eye in Vancouver here! maybe they'll start in Seattle and hop the border into Vancouver?